A stylish cockpit arch that compliments the sleek lines of this modern yacht. Outfitted with integrated dinghy davits, lifting a dinghy has never been so easy and secure. Future accommodations have been made for up to 600W of solar power. The client has also requested extended sternrail to offer more mounting space, better handholds from the swimplatform and a nice back rest when at the helm. 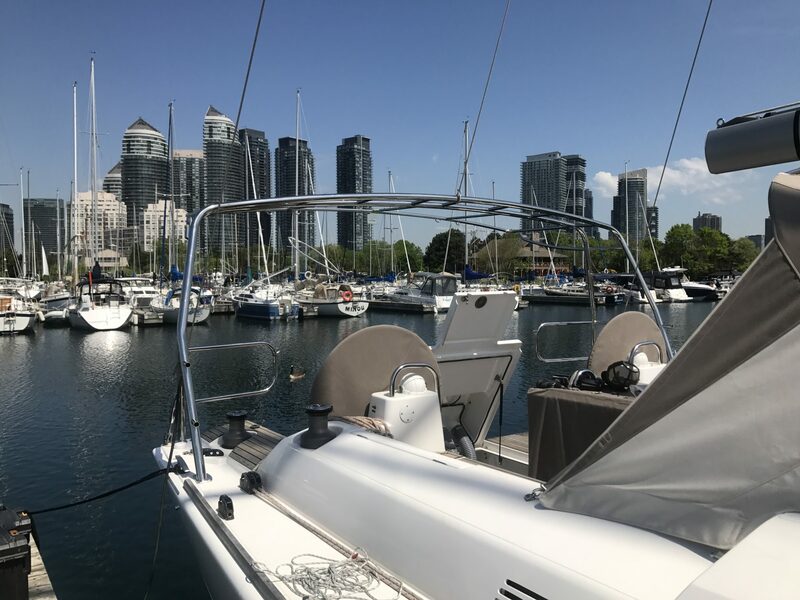 Klacko Marine did its utmost to preserve the modern and clean lines of the Dufour 500 while still providing a whole suite of powerful cruising options. Maybe Dufour didn’t literally break the mold with the GL500, but it certainly busted many of the constraints of old-world thinking with its “what if” approach. Dufour has echoed Apple’s old tag line, “Think Different,” and deserves credit for doing so. It’s also good to see that, despite all the focus on innovation, someone still remembered this big machine needed to sail and take care of its crew—something it does very well. This entry was posted in Arch Design and tagged 500, arch, davit, Dufour, Grand Large, klacko, Mimico, solar. Bookmark the permalink.